CUSTOMERS TELL US: "WE WANT STRAPS NOT CABLES"
Schweiss Doors is introducing an all-strap bifold door! Straps do the lifting and now straps do the latching too! It doesn't get any better than an all-strap door. The simplicity of the new latch strap is truly amazing! Schweiss did away with all the outdated cable-lifts, chains, sprockets and pulleys; strap lift doors now have 90 percent less moving parts. This is a real game changer in the bifold door world! It doesn't get any better than an all-strap door. 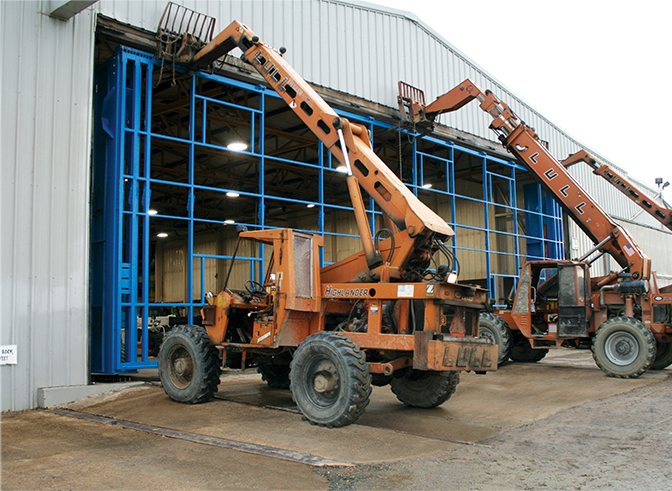 Some manufacturers still continue to try and sell outdated cable-lift bifold doors. 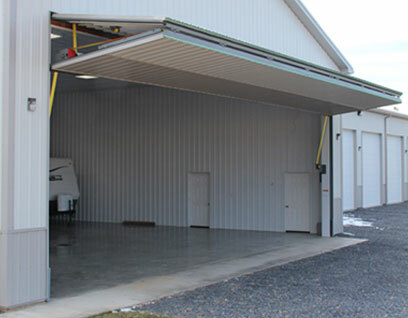 Cable-lift doors not only require frequent maintenance due to fraying, breaking and overwrapping, but also open much slower, are hard to adjust, are noisier, and not as safe as liftstrap doors. 'Lift Strap' bifold door. " I'd recommend liftstraps to anyone. " " I do like the liftstraps. the old cables on our door." "Can you convert our outdated cable-lift doors to the 'Schweiss liftstraps and autolatches?'" That's a good question! The answer is YES, we sure can! 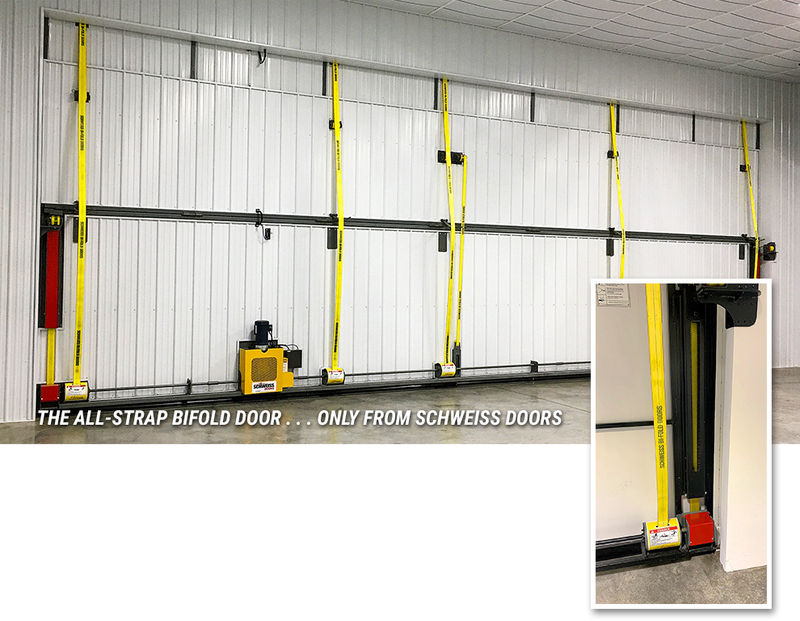 No matter the make, model or manufacturer of the door you own, you can see the obvious: Schweiss Liftstrap Bifold doors are a safer, faster, and better solution than outdated cable lift doors. 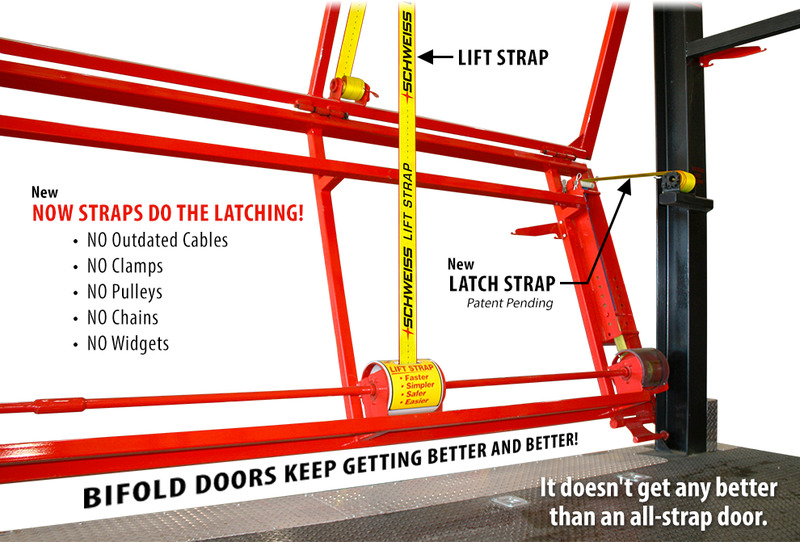 Ninety-nine percent of Schweiss bifold door customers are now demanding the stronger, patented polyester lift straps. For years, bifold doors were lifted and lowered by the slow, conventional means of outdated steel cables, that have a tendency to fray, overwrap, and break. Schweiss Doors is introducing an all-strap bifold door! Straps do the lifting and now straps do the latching too! It doesn't get any better than an all-strap door. The simplicity of the new latch strap is truly amazing! Schweiss did away with all the cables, chains, sprockets, and pulleys; and it now has 90 percent less moving parts. This is a real game changer in the bifold door world! It doesn't get any better than an all-strap door. THE SIMPLICITY OF THE NEW LATCH STRAP IS TRULY AMAZING! Schweiss did away with all the cables, chains, sprockets and pulleys; and it now has 90 percent less moving parts. This is a real game changer in the bifold door world! This is what every door owner wants and needs. 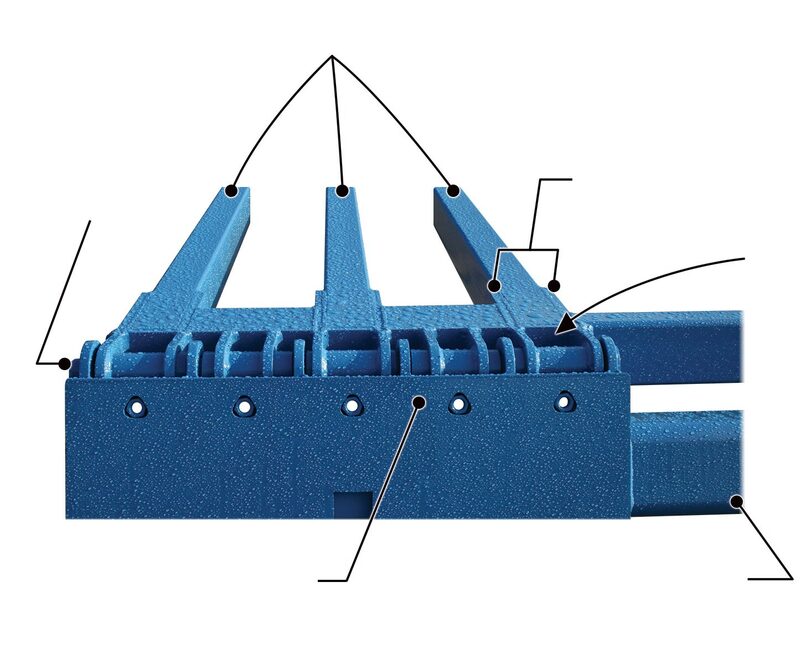 Unlike other latch mechanisms, the new design will firmly hold the door against your building in all positions; securing the door when open / partially open and will firmly lock the door when closed. 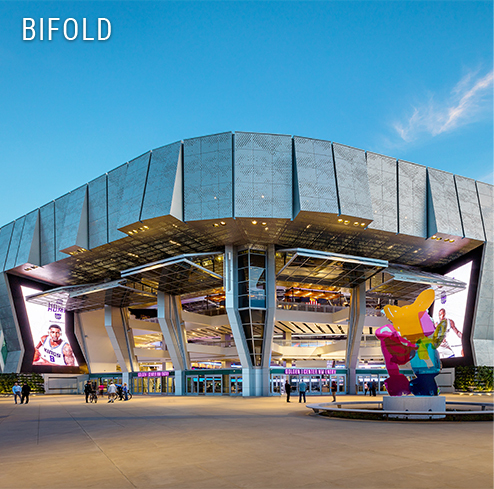 It will offer added protection from wind gusts while the door is in any position during operation. This is what every door owner wants and needs. Unlike other latch mechanisms, the new design will firmly hold the door against your building in all positions; securing the door when open/partially open and will firmly lock the door when closed. It will offer added protection from wind gusts while the door is in any position during operation. Schweiss Doors didn't just wrap our head around heavy-duty bifold door hinges, we went a step further and engineered a robust, user-friendly, greaseable hinge with a removable hinge pin. 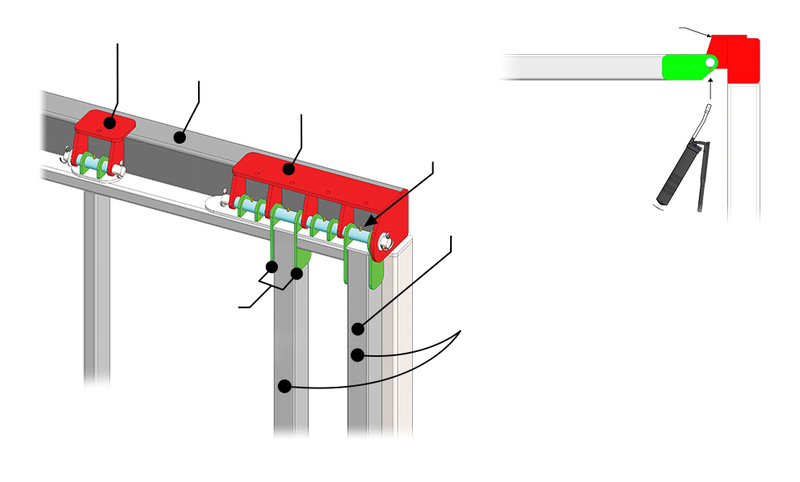 The new hinge design, with grease zerks on every hinge segment enables bifold door owners-whether they be private individuals or commercial customers-to periodically grease their hinges from the underside of the doorframe without having to go through the cumbersome process of first removing the top rubber weather seal. 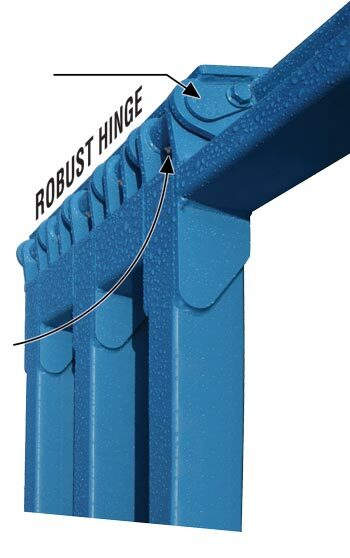 Schweiss doorframes are designed with triple push tubes that are tied directly into the wrap-around hinges that connect each vertical push tube directly to the header tube. 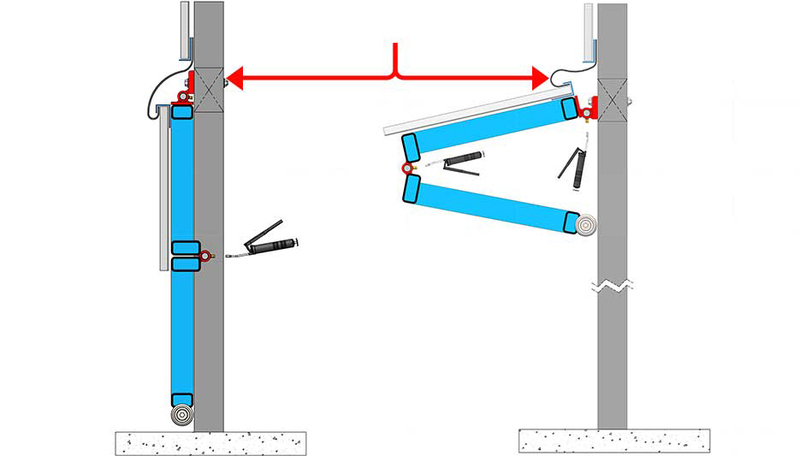 The advantage of triple push tubes is that forces of hydraulic cylinders are evenly distributed to the doorframe and the wrap-around hinges. STRONGEST HINGE ON THE MARKET! STRONGEST DOORFRAME ON THE MARKET! 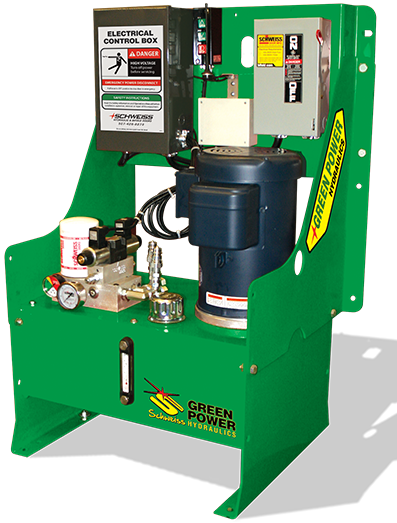 The door weight and hydraulic forces pull down on hinge when door is opening. • "Nothing on the market that even come close to the Schweiss hinge design." No Wood used on Schweiss Doors! 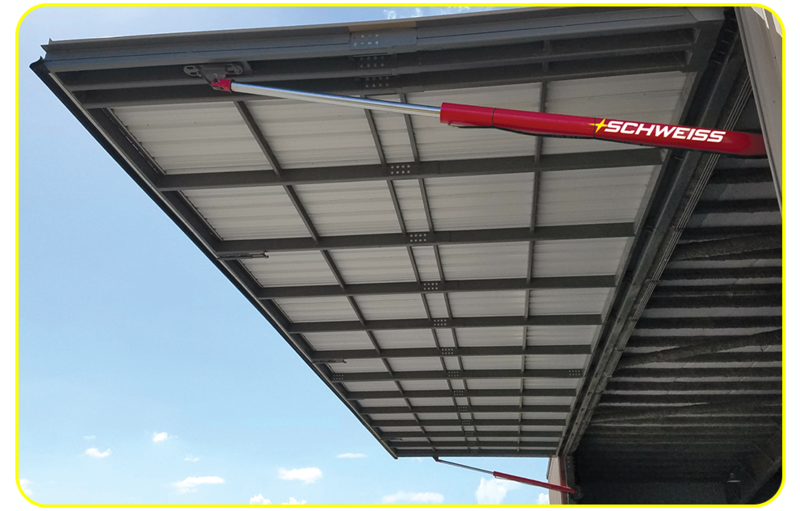 SCHWEISS is the only manufacturer to offer hinges that can be greased from underneath the door without removing the top weather. "No one else in the industry offers this unique feature" only available on Schweiss Doors. . . 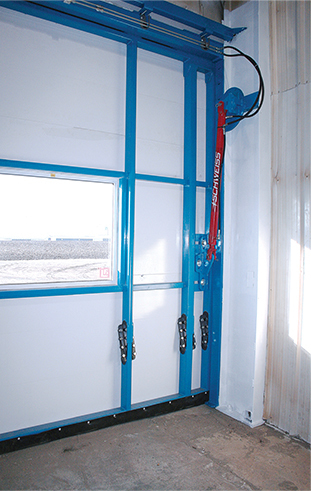 The Schweiss hydraulic door comes with its own self-supporting subframe for added strength and support. All models, come standard with double push tubes at each side of the door. 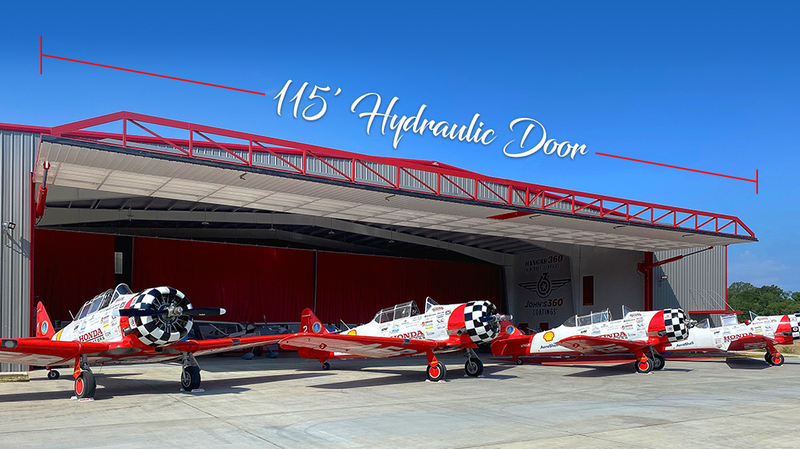 Schweiss hydraulic doors are renowned for their heavy-duty hydraulic cylinders with spherical bearings to extend the life of the door. Schweiss doorframes also come standard with the new robust hinge design with easy to grease hinges. 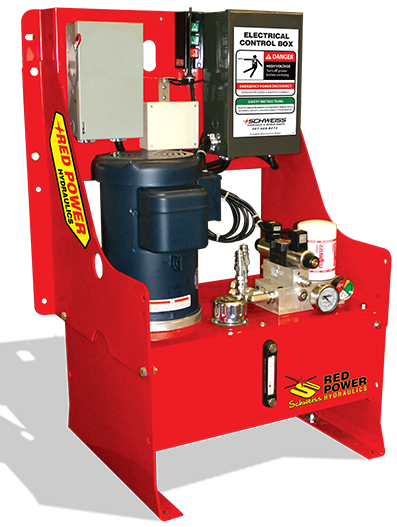 This Schweiss hydraulic door was designed for 175 mph windload and equipped with a hydraulic 2-speed valve for smooth operation, that includes a 12 volt backup system in case of a power outage. 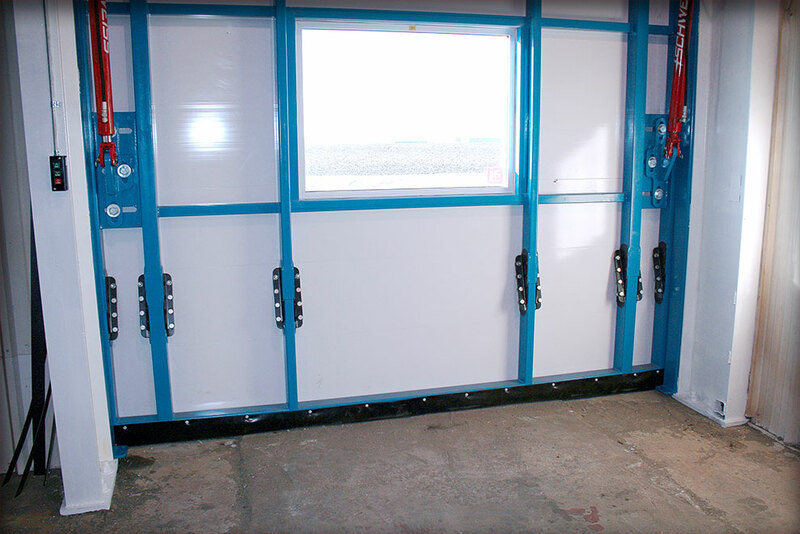 The door has the newly designed and patented wrap around hinges that can be lubricated from inside the building, making maintenance quick and easy ! 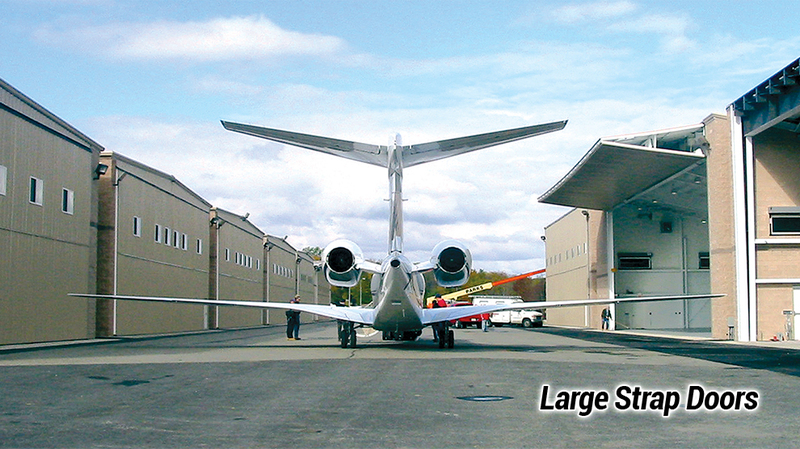 SCHWEISS DOORS USES BIGGER, BETTER, STRONGER CYLINDERS! "The choice is yours. Each door offers something different. Each has specific advantages. Tell us your situation so we can better advise you. The bottom line - it's the customers choice. Only Schweiss Doors gives you that advantage. Schweiss Doors already has a long history in the door world. 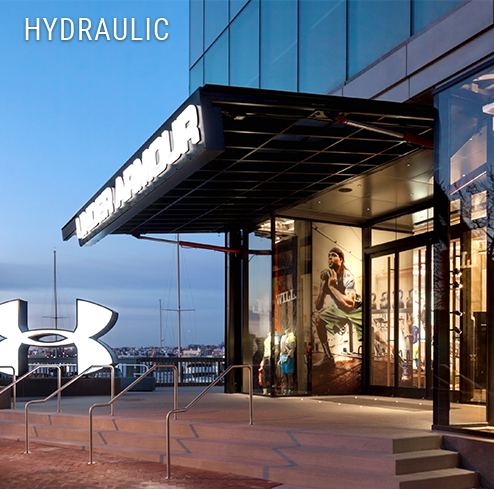 We are the 1st choice of thousands of customers and our Hydraulic Doors are leading the way. With either door you get Schweiss Quality. Talk with us first and we can make your decision easier... 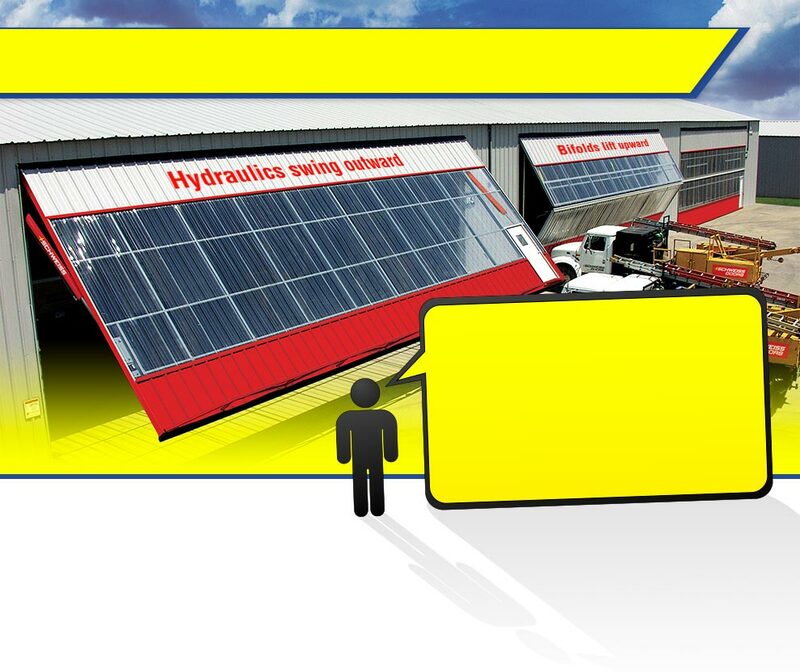 Hydraulic or Bifold! "We give you options so YOU can decide what is important to you." LOOK FOR QUALITY, LOOK FOR PRICE, YOU'LL BUY SCHWEISS!